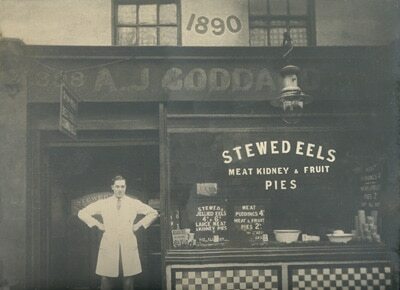 The Goddard’s Pie business was founded in 1890 by Alfred Goddard in Evelyn Street, Deptford, London. Here, Alfred set up his first pie and mash shop which was so popular during the late 1800’s. These shops provided hot, filling food for manual workers and the prices were very affordable. Alfred built up his business and his reputation during the early 1900’s when pie mash and liquor shops really started to flourish. In 1936 Alfred decided to pass the business to his two sons Robert (Bob) and George and both continued the family tradition. In 1952, another shop was opened in Greenwich at the same time as the Cutty Sark was placed in dry dock. For a time, pies were cooked in the Deptford shop and transported by van to Greenwich. After a couple of years the two brothers decided to take one shop each and Bob Goddard (our Grandfather) took the Greenwich shop while his brother remained in Deptford. In 1972, Bob and his wife decided to retire and passed the Pie House to his eldest son, Dave Goddard and his wife Pam. Dave and Pam worked hard to build up the business and extended the opening days to include Sundays. Greenwich was a very busy place and the Goddard’s name was very well recognised for hot and tasty pie and mash. Dave and Pam introduced their sons Jeff and Kane to the business at a very early age and both boys were working in the shop at the weekends from 10 years old. Sadly, in 1990, Dave Goddard suddenly passed away and the pie and mash shop was then managed by Jeff, Kane and Pam. During their management, Jeff and Kane Goddard successfully fought a Compulsory Purchase Order which related to the extension of the Docklands Light Railway (DLR) into Greenwich. This then led on to a substantial refurbishment of their freehold property which allowed them to install a larger kitchen and to also increase seating capacity. 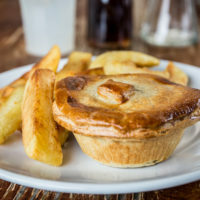 During this period of time Jeff Goddard improved the range of pie flavours that they made, he recognised the business potential that came from the many thousands of visitors to Greenwich. Unlike his predecessors, Jeff had formal catering experience and was able to develop flavours that customers of all Nationalities grew to love. Choice, price and attention to detail meant that the shop was busy every day of the week as people flocked to enjoy the pies, the ambience and a little piece of London history. 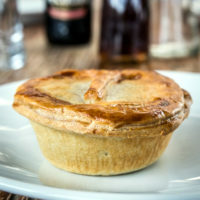 Jeff and Kane insisted that the family methods and techniques must remain in place and this is what sets Goddard’s Pies apart from some other pie makers. 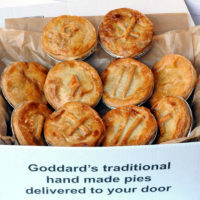 In 2009, after 18 months of searching, they secured a new commercial property in Borough Green, Kent and with business partner Sean Horton, began establishing Goddard’s Pies as a wholesale manufacturer of hand made pies. It took 3 months for our custom designed kitchen and storage facilities to be built and in April 2010 Goddard’s Pies was back in business as our brand new pie factory opened. 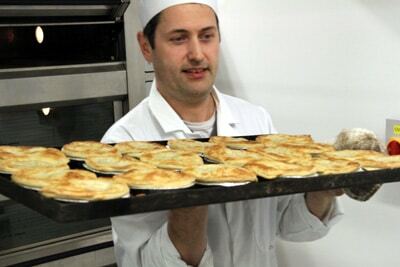 Our core values remain the same and all of our pies are hand made using traditional techniques and quality ingredients. Since that time we have grown organically as more people become aware of us and enjoy the unique taste of a Goddard’s pie. Due to our extensive history in Greenwich, we specialise in supplying pies, mash and liquor to pie and mash shops who want to recreate that authentic pieshop appeal. 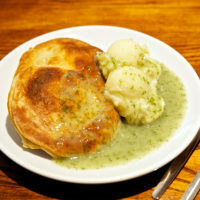 In August 2010 we became the sole supplier of pies and liquor to Sainsy’s Pie and Mash outlet at Lakeside Shopping Centre, one of the busiest pie shops in the UK. In April 2012 we opened Goddards at Greenwich in King William Walk, Greenwich. 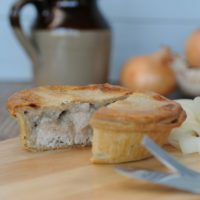 We are dedicated to supplying the trade and our range of handmade pies are now being delivered and consumed all over the UK and occasionally overseas and we continue to attract new customers from restaurants, pie shops, specialist caterers and foodservice companies. 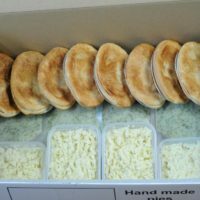 We are pleased to offer our handmade pies for sale online with delivery to your home or place of work. Each Goddard’s pie is handmade and baked for your enjoyment. 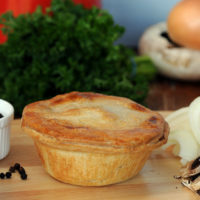 We offer an online mail order service so customers can now enjoy our pies wherever they are in the UK.